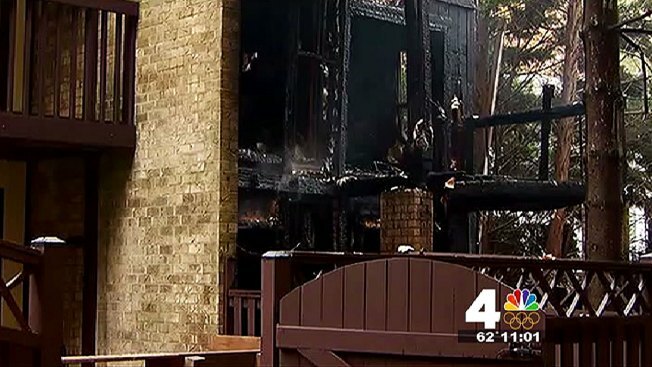 The body of a man who was unaccounted for after a two-alarm fire in the Alexandria section of Fairfax County has been located, Fairfax County fire officials say. Over 50 firefighters were called to the 6900 block of Deer Run Drive just before 4 a.m. to aggressively attack the blaze. After the fire was extinguished, firefighters used ladders to peer into the home and assess the damage. They were not able to go inside the heavily damaged home for a time due to a partial collapse. "The ceiling and one of the floors collapsed," said Fairfax County Fire spokesman Dan Schmidt. "We're trying to get a trackhoe in here and pull that out, so we can do a thorough search of the premises." Both neighbors and fire officials say the homeowner had difficulty breathing, and used oxygen tanks. It's not known whether the oxygen tanks played a role in the blaze. Authorities say the home was a total loss. Neighbors spent most of the morning worried for the homeowner, whom they feared had not made it out of the fire alive. Officials have not identified the victim, but say his cause of death will be determined by the medical examiner. A fire wall between the townhomes kept the fire from spreading to adjacent homes.